Eberhardt/Just Seeds’ organizer book mega sale! Mega cheap! Mega awesome! The good folks behind Eberhardt Press and Just Seeds have teamed up to create an awwwwesome 2011 day planner (think Slingshot.) These lil’ puppies are beeeautiful and feature 14 Just Seeds artists, including Icky A., Shaun Slifer, Erik Ruin, Josh MacPhee, and Kristine Virsis! The design, by Charles Overbeck, is elegant and tasteful, and features curatorial help from Roger Peet. In the back is a lunar phase calendar. Strong wire binding allows it to sit flat on your desk. Thick cardstock protects it in your pocket or your messenger bag. Totally, totally solid. Right now to celebrate all-things Eberhardt and Just Seeds (stay tuned for an interview with Charles Overbeck and Eberhardt blank notebooks available through this site!) 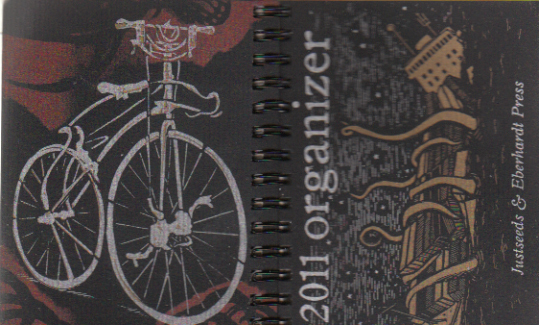 we’re doing a big ol’ planner sale. Go here to check ’em out and buy ’em for $5 (marked down from $6) or just opt for a between $3-$7 sliding scale option. These organizers are a special thing. We hope you get as stoked about them as we are! The Spanish Civil War is part of John Gerlach’s Simple History series, and the second title published by Microcosm (hot on the heels of Nez Perce Indians)! It’s 1936 and the world watches religious powers and fascists erupt into conflict with the proletariat left and anarchists in Spain. This zine presents a well-rounded and succinct account of the turbulence in late 30’s Spain. Complete with illustrations and a logical account of the complications throughout the civil war, this is an excellent zine for understanding history often poorly presented in high school. Hey Baltimore! It’s a “Smile, Hon, You’re in Baltimore” reading event with editor William P. Tandy tomorrow! Smile, Hon, You’re in Baltimore editor William P. Tandy is hosting an event tomorrow (Tuesday, August 9th) in Baltimore’s downtown! The free event stars at noon. Info from the SHYIB folks below! Fun! Yow! Smile, Hon, You’re in Baltimore! editor William P. Tandy will regale lunching office workers, street people and sundry ne’er-do-wells with his own strange blend of humor and misanthropy as part of the ongoing summer series “Poets in Preston,” Tuesday, August 9, in Preston Gardens, St. Paul and Pleasant Streets, in downtown Baltimore. This free event begins at noon. And Hell will surely follow. Poets in Preston is a presentation of the Downtown Partnership of Baltimore, Inc. Read more about it here: http://www.godowntownbaltimore.com. 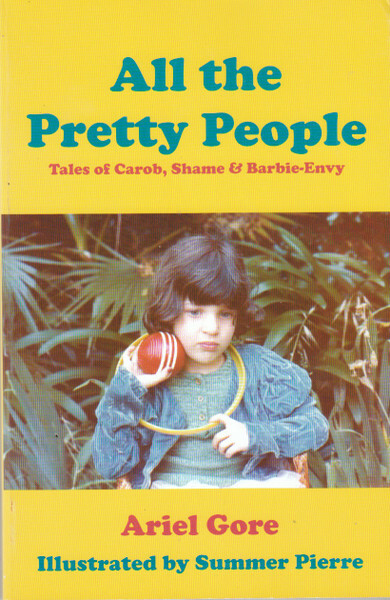 is coming soon from Eight-Stone Press. 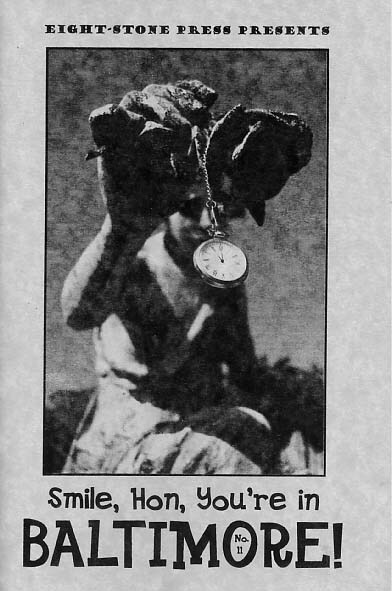 Pre-order your copy and read samples from the new issue here: http://eightstonepress.com/hon/hon14.htm. , contact me at wpt@eightstonepress.com. Hey Portland! Reading tonight: Ariel Gore with Tomas Moniz and Jeremy Adam Smith of Rad Dad! 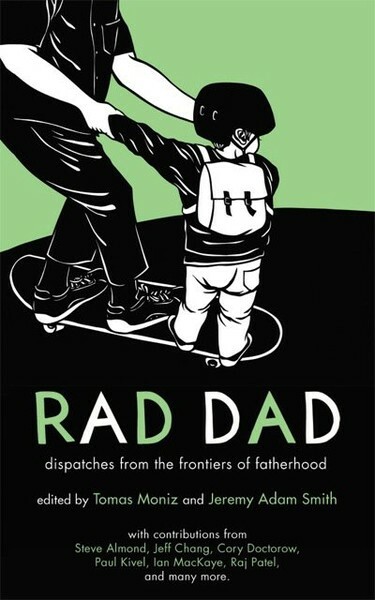 ABOUT THE NEW RAD DAD BOOK Rad Dad: Dispatches from the Frontiers of Fatherhood combines the best from the award-winning zine Rad Dad and from Daddy Dialectic, two kindred publications that have explored parenting as political territory. Both have pushed the conversation around fathering beyond the safe, apolitical focus and have worked hard to create a diverse, multi-faceted space to grapple with the complexity of fathering. Today more than ever, fatherhood demands constant improvisation, risk, and struggle. With grace, honesty, and strength, Rad Dad’s writers tackle all the issues that other parenting guides are afraid to touch: the brutalities, beauties, and politics of the birth experience, the challenges of parenting on an equal basis with mothers, the tests faced by transgendered and gay fathers, the emotions of sperm donation, and parental confrontations with war, violence, racism, and incarceration. Rad Dad is for every father out in the real world trying to parent in ways that are loving, meaningful, authentic, and ultimately revolutionary. Contributors Include: Steve Almond, Jack Amoureux, Mike Araujo, Mark Andersen, Jeff Chang, Ta-Nehisi Coates, Jeff Conant, Jason Denzin, Cory Doctorow, Craig Elliott, Chip Gagnon, Keith Hennessy, David L. Hoyt, Simon Knapus, Ian MacKaye, Tomas Moniz, Zappa Montag, Raj Patel, Jeremy Adam Smith, Jason Sperber, Burke Stansbury, Shawn Taylor, Tata, Mark Whiteley, and Jeff West. One of the best and most promising new comic artists out there today, Box Brown writes and draws the Everything Dies zine series as a hard (and oft times hilarious) look into the religious myths of our world. Issue seven is a comic retelling of the pan-cultural “flood myth.” Here we see Sumerian wind god Enlil (a total badass jerk a la an evil pro-wrestler) setting out to destroy the newly-created people of the Earth. The “Noah” of this polytheistic ark story is King Ziasudra, and his trajectory and fate are much different than the Christian Biblical version. Beautifully drawn and deep-packed with “the things that make you go hmm,” Everything Dies will keep you reassessing who we are and what we’ve built our shared narrative from. This is one of the most rewarding titles you’ll read all year. Massively, joyfully, fist-pumpingly recommended! The pirate ship of zine-bringing is sailing in the party! Reviewers this issue include Anne Thalheimer, D. Blake Wert, Davida Gypsy Breier, Eric Lyden,Fred Argoff, Gavin J. Grant, Joe Biel, Julie Dorn, Kris Mininger, Liz Mason, Maynard Welstand, and Stuart Stratu. And on top of the scores of new zines reviewed in this issue, we are treated to excellent editorials from Dread Sockett and our trusty editor captain, Davida Gypsy Breier, addressing community issues in zine making as well as “Defining ourselves to death.” As always, the ship sails freely and each contributor is allowed a free voice to say as they please!